The most applied use of aerogels now is thermal insulation. Insulating products made of aerogel materials are gaining huge admiration in the United States and the coldest regions of Europe. China is one of the global leaders in manufacturing and trading of silica aerogel materials across the globe. Huge investments have been poured into this industry in China by some major manufacturers to gain their positions in competitive world. Changzhou National Hi-Tech District signed an agreement, underneath which China's biggest aerogel materials manufacturing base will be established in the district. Changzhou National Hi-Tech District plans to put in a enthusiastic determination to bring in more than 10 aerogel production facilities within five years, with the belief of producing an output value projected at 10 billion yuan (approx. USD 1.5 billion). Agreeing to the agreement, Hongda Technology (Beijing) Co., Ltd. will set up an aerogel material manufacturing facility in Changzhou National Hi-Tech District, to nurture the atmosphere for and bring in new aerogel material application projects. The building construction industry is careful to have the largest cost effective and energy-saving potential impact. Space heating is the utmost energy exhaustive end-use in homes accounting for 70% of the total final energy consumption. Currently, silica aerogel thermal insulation in modern buildings has become a critical way to meet the difficulties of enhanced energy efficiency, by which the conduction of heat through walls, ceilings, windows roofs and floors can be retarded efficiently. Moreover, rising demand from North America and European markets will provide the major boost to the Chinese aerogels manufacturing industry. However, high production cost is the likely to be the major restriction for the market players and market growth over the forecast period. Goldstein Research analyst forecast China aerogel market is probable to thrive with the growing demand in building construction industry in coming years. Further, the China aerogel market is expected to expand at a CAGR of +35% over the forecast period as advancements aerogel manufacturing technology will augment the growth of aerogel product sales in the region. Based on the aerogel form, batteries accounted for the largest revenue share of more than 70%, which is likely to expand at a CAGR of 31.2% during the forecast period. Blanket aerogels are broadly used in the construction sector, which is the key factor likely to determine the fastest growth of this segment. The report covers the present ground scenario and the future growth prospects of the aerogel market for 2017-2025 along with the market players’ analysis. We calculated the market size and revenue share on the basis of revenue generated from major players in all major regions. China aerogel market is forecasted on the basis of revenue analysis, product benchmarking and strategic developments of key market players. China Aerogel Market Outlook 2017-2025, has been prepared based on an in-depth market analysis from industry experts. 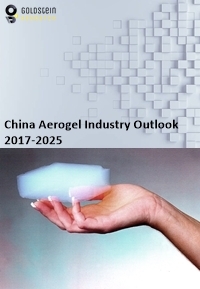 The report covers the competitive landscape and current position of major players in the China aerogel market space. The report also includes porter’s five force model, SWOT analysis, company profiling, business strategies of market players and their business models. “China Aerogel Market Report” also recognizes value chain analysis to understand the cost differentiation, pricing models to provide competitive advantage to the existing and new entry players. Our China Aerogel Market Report comprises of the following companies as the key players: Aspen Aerogels, Cabot Corporation, Aerogel Technologies, Nano High-Tech, Guangdong Alison Hi-Tech, Active Aerogels, Enersens, Jios Aerogel Corporation, Insulgel High-Tech, Protective Polymers, BASF, Guizhou Aerospace, Green Earth and Aerogel Technologies (GEAT).